The Halsey Stop is blowing up! 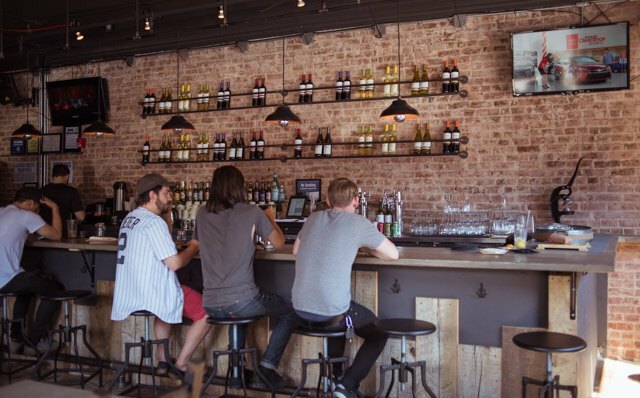 If you've passed by in recent months, you probably noticed the transformation of the old party hall into one of the Halsey L stop's first major restaurants. Industry 1332's opening has definitely been carefully paced and gradual, but it's an opening that merits excitement and anticipation—the atmosphere is dope and the food is bomb. The venue itself, on the corner of Irving and Halsey, has an unadorned, lo-fi aesthetic which harkens back to Bushwick's industrial roots: reclaimed wood, exposed brick walls and tables made of concrete tops and rebar legs. 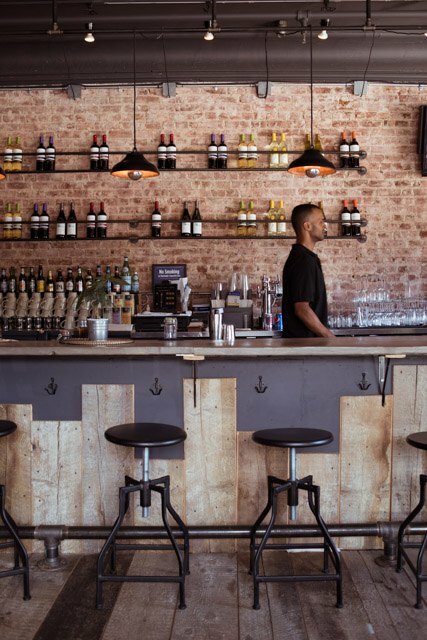 A Bushwick resident for over 15 years, co-owner Ariel Infante saw the need for the kind of place that combined a chic, rugged modern edge with remnants of Bushwick's past. 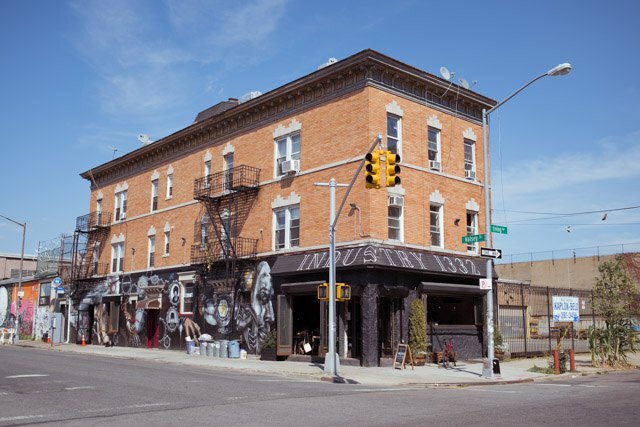 "The industrial history of Bushwick was a predominant factor to our whole decor scheme," Ariel said. 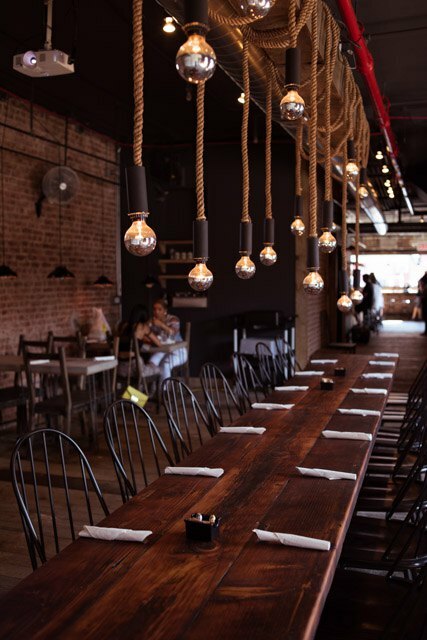 "'Bushwick' means wooded district, hence the beautiful reclaimed wood flooring throughout the entire space." Tapas, drinks, a good atmosphere...what more could you want? "Since I put the bottles out, people definitely started coming out more," says Infante on the recent addition of alcohol to the menu. 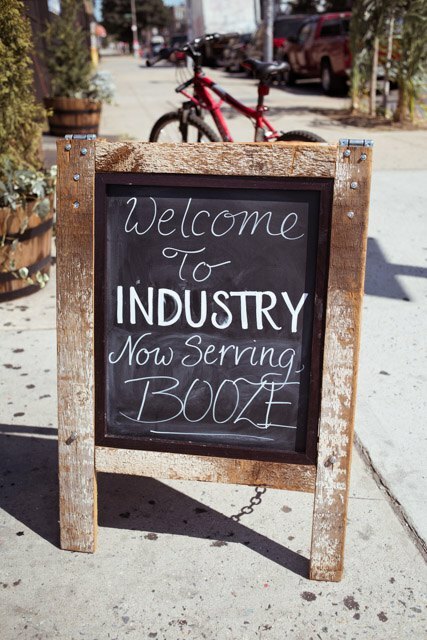 They hope to expand their beer taps and wine selections with locally sourced craft beers, and once they get a full liquor license, cocktails should be making it onto the menu as well. The opening has been a bit of a slow-burn, as the owners make sure they get to know their market and customers. "Right now, its only brunch and dinner, but there are plans to add lunch to the menu," says Infante. The drinks and atmosphere make this place good. What will make this place great for years to come is the food. Tapas, or small plates, are the focus at Industry 1332. Come dinnertime, expect heartier, Latin-infused entrees like the pan-seared tuna served over roasted vegetables and a mango chutney. If you're coming for brunch, don't miss the carne asada con yucca and the torreja, a brioche French toast with fresh berries and whipped cream. If going with a large group of friends, do your best to snag a seat at the long family table in the back and make sure that no one orders the same thing. You'll definitely want to eat as much as you can. Dinner entrees can run on the pricier side with smaller portions, but they're not without merit. Each plate was a deliriously exciting blend of flavors, plated in a way that will compel you to Instagram your food (even if you find the habit loathsome). The service is quick, but based on the size of the entrees, you might want to make sure you get started with an appetizer and end your night with one of the desserts. To complete your comprehensive dining experience, you'll certainly want to try the torta de tres leches and the churros. "We are just regular locals trying to give back to our community," says the team on what they hoped to achieve with Industry 1332. It's definitely a labor of love for the neighborhood, and it's refreshing to see a new business with a good mission at its core. 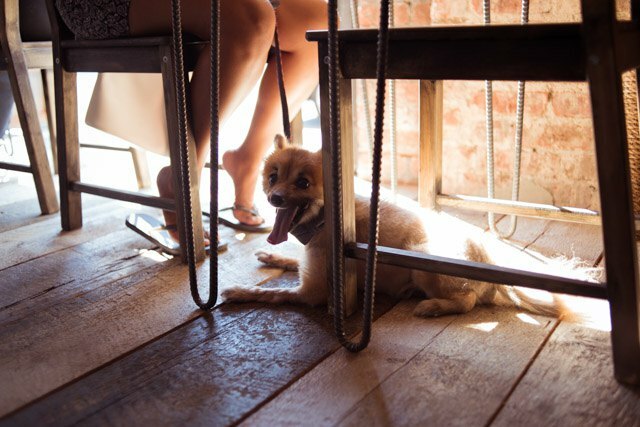 It's a great place to sit and drink, a great place to have a meal, and within a few months, it might be one of the first places you think of when suggest a place to get a taste of the neighborhood.